The Christmas countdown has begun: just 3 weeks left ! The good news is that finally , after 3 years, the classical Christmas Market of Piazza Navona has reopened December 2nd, and will last until January 6th. You can’t miss it. It represents the Christmas spirit in Rome and you will find handmade gadgets , little ideas for Christmas gifts, decorations, clothes and any kind of sweets! Once Piazza Navona was the site of the local market, but in the middle of the 19th century this last was moved to Campo de’ Fiori, and that of Piazza Navona became the ultimate Christmas Market in Rome! How to reach it from Yes Hotel Rome ? Very easily ! Just walk to the Termini Station and from there take Bus Number 64 or Bus Number 40. Stop at C.so Vittorio Emanuele/ Argentina. Just a few minutes’ walk and you have arrived ! Our staff will give you even more tips , we wait for you ! It’s part of the British McArthurGlen Designer Outlets and includes more than 140 boutiques located within a full-service setting where nothing is missing: children’s area, beauty center, tailoring service, car parking, cafes and restaurants, of course. Discounts range from 30% to 70% all over the year, on all fashion design brands such as Valentino, Roberto Cavalli, Michael Kors, as well as on casual labels like Diesel and Guess, and sport brands, starting from Adidas and Nike. Opening hours: every day from 10 am to 9 pm. It offers more than 180 brand stores, with discounts from 30 to 70% year round, as well as a number of facilities and services, including play areas for kids, restaurants and cafes, helmet deposit for bike riders and umbrella rentals. How to get there: about 50 km from Rome. Get on highway A1 direction Napoli; exit Valmontone. For over sixty years it’s the most popular flea market in Rome, where you will literally find anything you can think of: clothes, shoes, accessorizes, pieces of furniture, ethnic items and handicrafts, bycicles, paintings, LP, toys and any sort of antiquities. Given its size, we suggest you begin your visit as earliest as possible: this will allow you to visit it all (it might take up to 3 hours) and to have better chances to find great deals. This is the must-visiting place if you are looking for vintage clothes. At the market stalls of via Sannio you will find any shade of jeans, shoes and t-shirts as well as theatrical customs, leather and suede jackets original from the ‘70s.Via Sannio’s market spreads just beside St. John Lateran’s Basilica, one of the most important churches in Rome: you can successfully combine here your leisure time and sightseeing agenda. How to get there: from Termini station (stroll distance from Hotel Des Artistes), catch metro line A direction Anagnina and get off at San Giovanni stop. There is something for all tastes in Rome city center, from high fashion and department stores to tiny handicraft boutiques… you just need to know where to go. 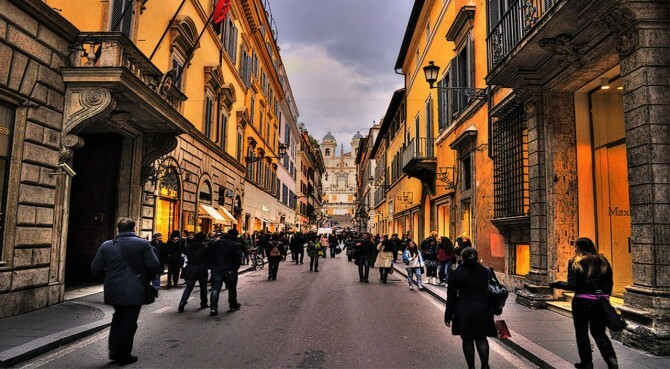 If you are looking for shoes and clothes nearby the historical hot spots, via del Corso (the lane connecting piazza del Popolo to piazza Venezia) teems with options to suit all budgets. Take also a visit to Galleria Colonna (nearby the Parliament) and let yourself be enchanted by its elegant architecture. The adjoining road via del Tritone is a must if you are interested in leather bags and accessorizes.Piazza di Spagna and its neighboring lanes (such as via dei Condotti and via Frattina) are the core area for all the high fashion designers stores: Bulgari, Valentino, Vuitton, Burberry, Gucci, Dolce & Gabbana, Prada, only to name a few. Following via del Corso style, there is via Nazionale (the lane starting from piazza della Repubblica, at stroll distance from Termini station): the realm of casual clothes,underwear and shoes shops. Rome Fringe Festival – since 2011 a most awaited event every Summer – is just around the corner. From May 29 to July 5 the gardens of Castel Sant’Angelo will be livened up more than ever by this festival entirely dedicated to independent theatre & performative arts. Every day from 9am to 2 in the night the whole area will be popping with an explosion of non-stop shows, art exhbits, day & night markets, refreshment areas, wine & food tasting, workshops and kids activities. All is free but the shows, which €5 ticket will be paid directly to the given performing company. A considerable variety of performances are scheduled indeed, involving involving song theatre, comedy, drama, social theatre, dance, stand up, street art, clowning, puppet, poetry, literature. The festival definitely has an international appeal: a number of foreign artists play their role in it. From Yes Hotel, to go and enjoy the breeze nearby the Tiber river, at Castel Sant’Angelo gardens, you just need to catch bus #40 express or metro line A and get off at Lepanto! One month is left to Christmas and preparations for the major shopping time in the year are in full effect. While shops windows have been shining for some weeks already, enlightened by their lavish decorations, Christmas stands & proper markets are being set up all around the city these days. Typically Italian Christmas markets usually include puppets, toys, sweets, but their backbone is always in the befane with their grooms (old witches chasing away bad luck) and in the nativity scenes (presepi). If you like them, don’t miss out the nativity scenes’ exposition at Sala del Bramante (in Piazza del Popolo, next to the Church of Santa Maria del Popolo): more than 200 presepi will be on display. – “Christmas market” at PIAZZA NAVONA: definitely the most traditional one. From 1 Dec to 6 Jan, 10am-1am. On the Epiphany day (January 6th) the Befana will distibute sweets and “coal” (edible & sweet of course!) to all kids in the square. – “Christmas at Auditorium Parco della Musica“: market, ice-skating, play area, open daily from 6 Dec to 6 Jan.
– “Magic Christmas” at Parco Rainbow Magicland: Christmas market in the amusement park until 6 Jan.
– Japanese Christmas market at via Casilina 713: on 14 and 21 Dec only, 10am-8pm. Ask Yes Hotel staff for more suggestions!